If you, a friend or family member have any of the following then Villars might work brilliantly for your ski or summer holiday. This is by no means an exhaustive list (it would be impossible to include every condition) but many have similar or common factors. As often someone may have a condition that we have not yet come across please do ask us if you are interested in the resort and we can try to help. For more information on mountain activities in Villars please contact us. A wonderful Swiss ski school. The Directeur, Marc-Henri Duc, has been helping us for a long time. 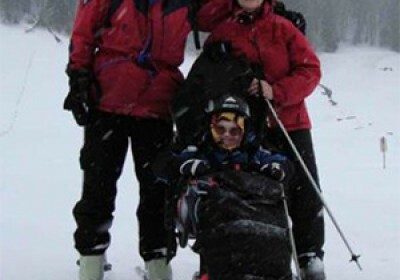 They have some fabulous ski instructors for adaptive and assisted skiing - especially for blind and visually impaired. We have also known Claude-Alain Hofer and his team for many years and he also offers fantastic experiences for all health-related conditions. All the news, feedback articles and press releases illustrate how Villars helps to enhance people’s lives. Also, in many cases, showing how Ski 2 Freedom works in close association with Villars to help raise awareness of the empowering benefits of mountain activities such as skiing and promoting accessible, social and inclusive tourism. If on reading our Villars page, you have your own experiences and feedback of the resort (winter or summer) that you would like to share or feel would be encouraging to others, please do not hesitate to send them to us for inclusion on both our website and social media – photos and film clips also welcome.